So Kscope16 is over, done and dusted, and I’m back home. A quick thankyou to everyone who I met – was amazing to be able to put a face and a voice to the names/blogs/twitter accounts I’ve followed over the years! For everyone else – you’ll be glad to know the likes of Jason Jones, Cameron Lackpour, Tim German and Celvin Kattookaran (and others I’ve naught mentioned for brevity, but you know who you are) are as tragically nerdy amazingly bright, excited and enthused about this space as their blogs suggest. I was very endeared by their absolute state of gregarious comradeship – a spirit of learning and challenging yourself to become better – lead to both a humbling and inspiring couple of days. A really quick story before I get started on the actual post. I was standing in the main foyer with a few people watching the boats go by when Celvin (a Chi-City native) commented that: ‘It’s amazing you know – tour guides on the boats volunteer all their time! They don’t get paid at all, they just do it because they love the city of Chicago’. Silence reigned for a few moments – until the irony of Celvin (of all people) commenting in shocked admiration that ‘people that volunteer their time, just for the love of it’ sunk in! So this will be the first in a series – perhaps not as compleat as others – looking at some of the new features in PBCS that will hopefully wend their way back to On-Premises at some point! This is a 16.07 PBCS Test environment – released early July. First thing I’ll be looking at is the automated Smartlist generation. Nice and simple, we create a few new members. 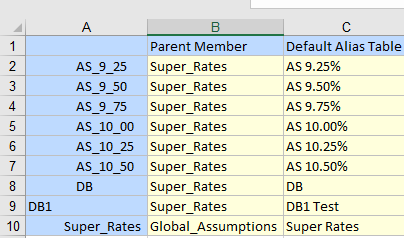 You’ll see here I’ve created a list of members under a parent Super Rates. 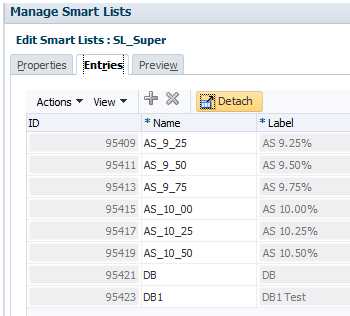 Next up, create a smartlist, same as normal. At the bottom you’ll see the “Create From Members” Checkbox with a member selection. 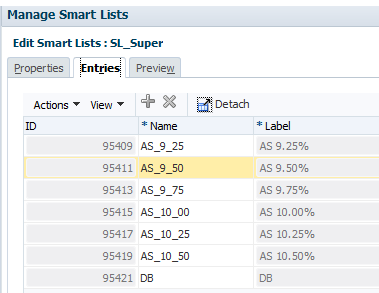 I’m obviously picking the descendants of Super rates rather than hard coding the list (which becomes very cool shortly. 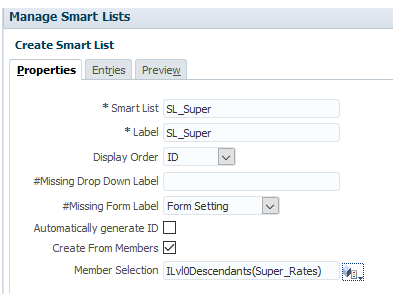 After saving the smartlist, returning to the entries page shows the members! You can see that the Name is set to the Member Name, while Label has been updated to the Alias. 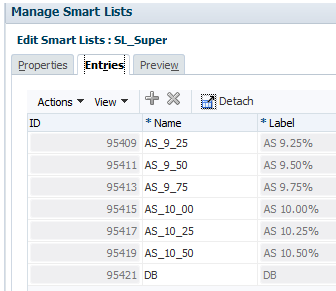 In an earlier test I used the Aliases as the member names (because smartlist names have some limitations) – the spaces were removed as well as the special characters (%) and replaced by underscores, but the label was still correct. You’ll now be wondering what happens if you create a new member – well let’s have a looksee.